When you look at sales of the iPhone or Blackberry as a percentage of total cell phone sales, they are still a tiny smidgen of the one billion phones estimated to be sold this year. But when you look at what really matters—their share of revenues or operating profits—the picture looks a lot different. Deutsche Bank analyst Brian Modoff calculated the share of operating profits going to each major mobile handset manufacturer and came up with the eye-opening chart above. 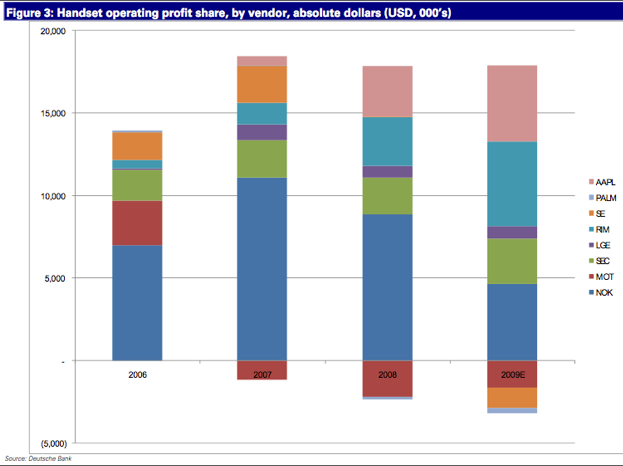 It shows Apple (pink) and RIM (turquoise) increasingly taking a disproportionate share of industry profits, mostly at the expense of Nokia’s diminishing handset operating profits (blue). 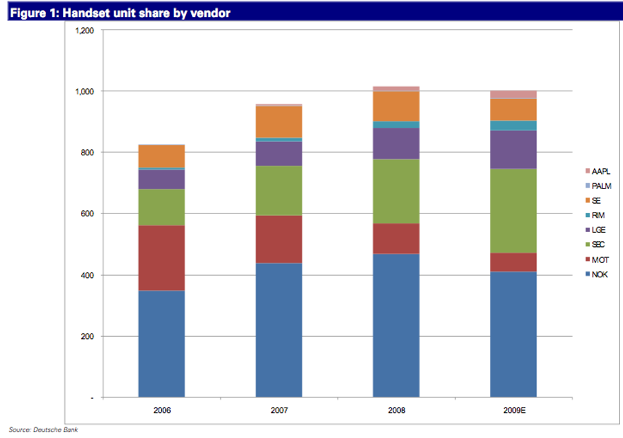 In a note, Modoff writes: “Increasingly, the smartphone vendors are claiming more of the industry’s profit dollars even as the pool of profitability stabilizes or shrinks.” Thanks to the success of the highly-profitable iPhone, Apple’s share of industry operating profits went from 3 percent in 2007 to 20 percent in 2008 and will grow again to an estimated 31 percent in 2009. RIM, maker of the Blackberry, is doing even better, increasing its estimated share of industry profits from 8 percent (2007) to 19 percent (2008) to 35 percent (2009). So adding those two together, Apple and RIM are expected to account for an incredible 66 percent of industry profits this year. Meanwhile, once-dominant Nokia is seeing its estimated share of industry profits drop from 64 percent (2007) to 57 percent (2008) to 32 percent (2009). The only other major manufacturer to grow its profit share is Samsung, from 14 prcent last year to an estimated 19 percent this year. (A note on methodology: These numbers take into account operating losses at companies such as Motorola and Palm, and the total adds up to 100 only when you subtract their losses, which are expressed as negative percentages). Such a massive shift in control of industry profits is unprecedented and speaks to the growing value of software in the cell phone industry. It also speaks to the missteps of the traditional handset manufacturers (only Samsung seems to have its act together) and the end of unbridled growth for the industry. Modoff expects total unit sales to decline slightly this year back down to one billion, while industry revenues will continue to come down from their 2007 peak. 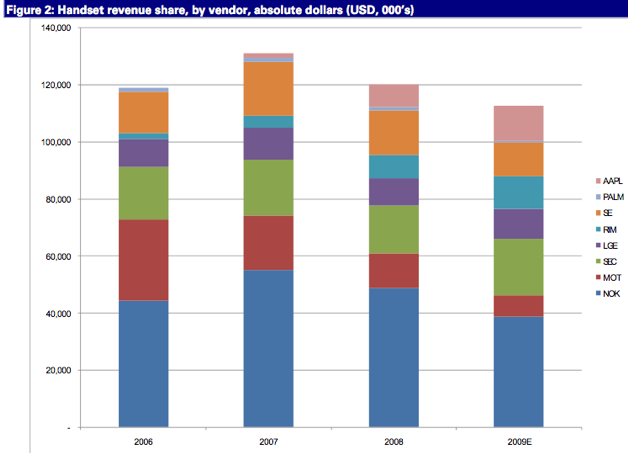 Nevertheless, Apple and RIM, will continue to take share in both units and revenues as the rest of the industry struggles (see charts below).